#FANUARY is an art project where participants create an image of some person, place or thing they are a fan of every day for the month of January, and then post the image and tag it #FANUARY on social media such as Twitter or Instagram. Bring in the new year by appreciating and sharing the things you love! There are no rules, and anyone can participate. 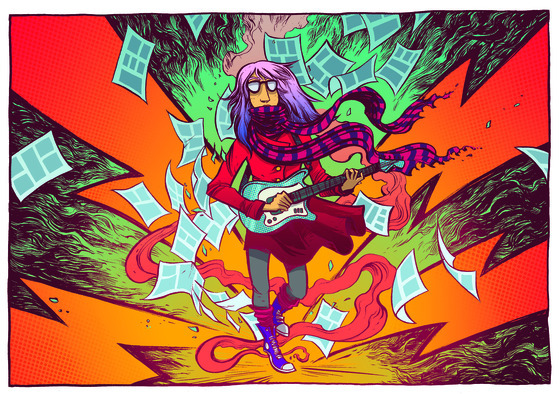 Mini-Comics Day is March 8th! Mini-Comics Day is coming up fast! Tell your friends! In Minneapolis, we’ll be having a Mini-Comics Day mini-comics swap in the evening at a location to be determined. We’ll be collating the Lutefisk Sushi Volume E boxes this Thursday at 8:00 at AE. We could use some extra hands getting the boxes filled… just show up if you want to help out and get a sneak preview of the amazing contents of the box. The option with the most votes will be the basis of next year’s project. Please only vote if you intend to participate in the project. Note that you do NOT have to be a resident of Minnesota to participate in the 2013 project. Mystery Box: Mysterious limited edition box full of mysterious comics and art. Voting ends sometime on August 10th. 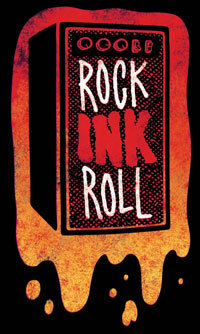 Sometime shortly after that we will be taking nominations and voting on a featured artist for the show. We will be doing another one of our Lutefisk Sushi box-full-of-handmade-Minnesota-mini-comics shows at Altered Esthetics next year, and the time has come to pick a featured artist. As usual, this being Minnesota, we have a wonderful selection of nominees… I’d be delighted to see any of them win. You can preview the artists’ work by clicking on the images below, which will take you to their websites. We’ve dusted off the old message board for the voting… you’re encouraged to pimp for your candidates in the comments. Please only vote if you are a Minnesota artist who plans to participate in the show. Thanks! Poll ends sometime on September First. Lutefisk Sushi: Volume E — The Ballot Boxes Are Open! 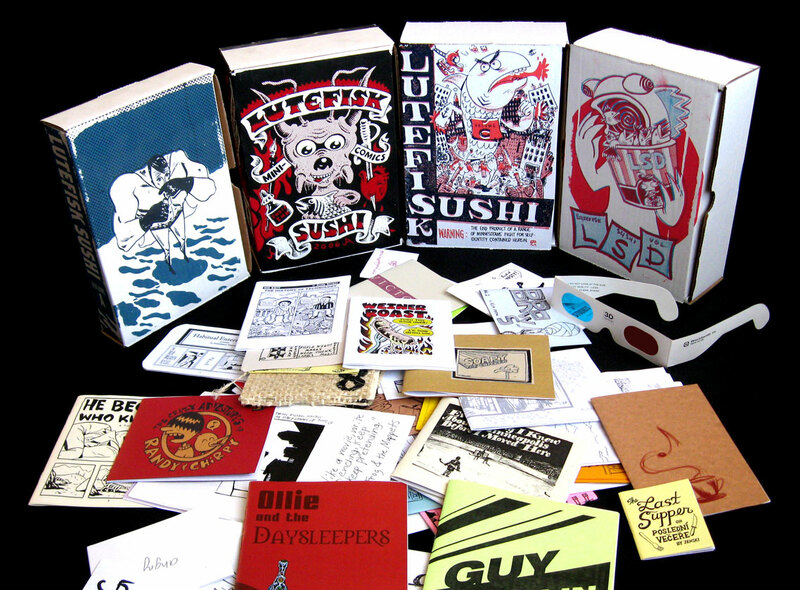 Minnesota’s premier comics art show LUTEFISK SUSHI is back for its fifth season in 2012. While the opening reception is over fifteen months away, we need to decide on a featured artist ASAP! As in past years, the featured artist will design the sushi box, and will have a whole wall devoted to their artwork during the gallery show at Altered Esthetics in November, 2012. See websites of past shows here. NOTE: Artists must reside in Minnesota or have some strong connection to the state. NOTE: If an artist does not wish to be nominated, or does not respond to us before August 25, they will not be listed as a nominee. September 1: Voting closes at noon; Winner is formally announced at 6pm at the Nordeast Comics Summit, and online. As in past years, voting will take place on www.cartoonistconspiracy.com/conspire. So jump on that site between August 25 and September 1 to vote! Voters must register on the Cartoonist Conspiracy website (it’s free). Voters may vote only once. Past featured artists are Vincent Stall, Ken Avidor, Kevin Cannon, and Danno Klonowski. Questions? Post them in the comments section below. They are also available in 150, 300, 400, 600 and 800 pixel wide sizes. You can embed any of these sizes by replacing the 200 in the embed code with the appropriate number. 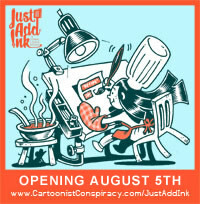 Click here to download Just Add Ink Submission Reminder images like the one above in all sizes. Please do help spread the word!